Image Credit: Domenico Salvagnin, "Red Fox"
"This is life seen by life: I may lack meaning but it is the same lack of meaning that the pulsing vein has." When I step out of the door of my house in the late evening, I inhale the silence and a trace of chill that even on summer days soothes the night air in Berlin. 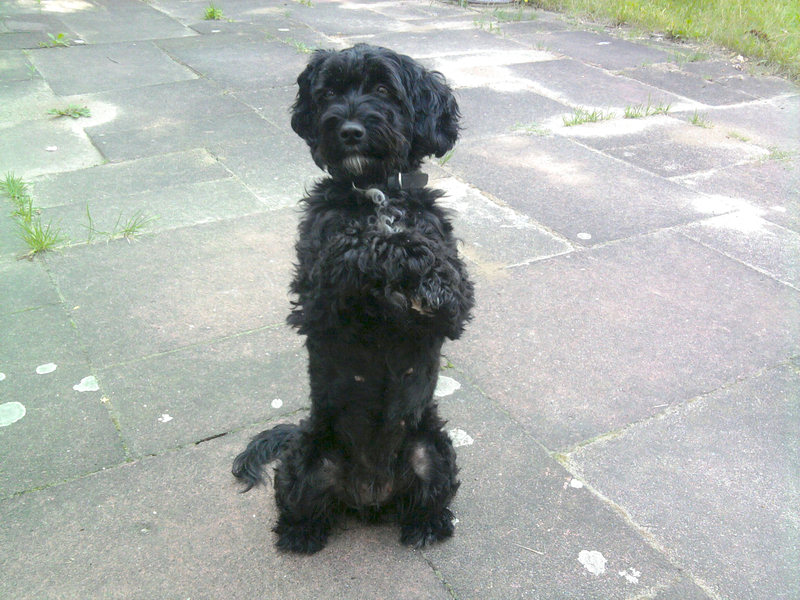 I share my life with a small mixed breed black poodle. In the evenings, she becomes restless after 10 p.m. and urges me to accompany her out. Berlin, many ecologists think, is Germany’s and maybe even Europe’s capital of city creatures. It is being invaded by wildlife to the same degree that it is becoming crowded by international hipsters. To be open to these newly arrived creatures seems to be an opportunity for this urban area to reconnect to a sort of truth, to recreate itself not according to a formal plan but in response to a need. More often than not, my dog shows me the way to Berlin’s wilder side. When I open the door on this particular night, the dog freezes on the stairs for two seconds of rapture and tense apprehension. Then she raises her tail in a sharp arc and darts into the bushes that grow along the walls. I close the door and walk into the silence of the small street. The blocks of three-story buildings built in the 1930s are slightly recessed from the street, giving way to stretches of turf. My dog friend does not exactly need to go out. She wants to. And she wants me to be with her. She wants to go out because she wants to meet the fox. It is the presence of the red fox that makes my dog’s tail raise and vibrate, that causes her to sniff the air and to exhale excited puffs of breath. Unlike me, my poodle knows about the creatures who roam the urban streets by night—creatures other than those compliant beings who live with humans. 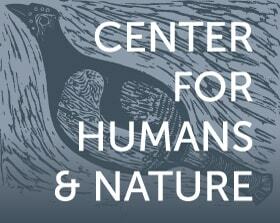 Creatures like the fox, the ferret, the wild boar, and the bat, who live in our midst but remain hidden. My poodle friend wants to meet them, sniff them, survey them, be watched by them. So I sometimes meet them, too. Or at least they meet me. During my nightly strolls, I often feel gazed at by the life that inhabits the night of the German capital and turns it into a perfect wilderness. To be wild in Berlin is a niche in time, not in space. Led by my poodle I also am embraced by this niche. Because my nonhuman friend is so eager to be in my company when she meets all these beings, she has become a kind of sixth sense organ for me. She gives me a sense for life. Her eagerness allows me to watch and to be watched. Through the gaps between the buildings a deeper dark drifts into my street, a blackness that emerges from the acorn and acacia trees along the S-Bahn line behind the house. Further, beyond the rail tracks is the huge cemetery, sheltered by the deep black silhouettes of beech, pine, and chestnut. Still further, the faintly lit square lies in front of the massive, granite-gray Olympic Stadium, erected in 1936. Quite a lot of writers and artists who have lived in the capital rest in that cemetery, which is now swallowed by thick night. The romantic poet Theodor Däubler is among them, the singer Dietrich Fischer-Dieskau, who so unforgettably interpreted Friedrich Schubert’s “Frühlingstraum” (“spring dreaming”) is also buried here. By day, the graveyard is layered with a variety of tones. Blackbirds whistle their fluid tunes, nightingales burst into sparkling crescendos. After dusk, the emmeshment of individual destinies—the lifelines of humans and other creatures and the traces of history, the tracks of wind and the liquid offerings of the rain, the fleeting traffic noises and the flavour of the air—become hidden from my senses. When I am out with my dog, however, I realize that they are still visible, they are still perceived. On clear nights, the moon looks at us as we slowly make our way down the street, as the dog, her stiff legs quickly moving, dashes into the bushes and delves into the shadows between the blocks. 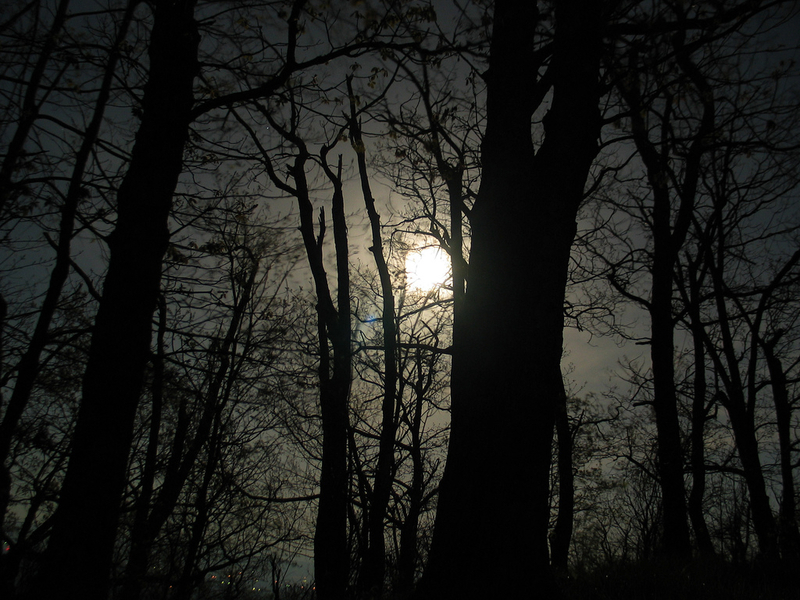 On winter nights ringing with the chill, the moon glares at me through black cobwebs of twigs. During indulgent summer nights, it twinkles through dense layers of leaves moved by the wind and the faint noises of the city. The moon gazes at me, as it looks at all the other hidden forms and at the shadows moving secretively across the ground. It looks through the branches of the acorns and acacias, and it silently glances at the deeper shadows beyond the rail tracks. I know that its silver light also embraces the fox, although I rarely see the animal. But I always wait for the chance to meet it. 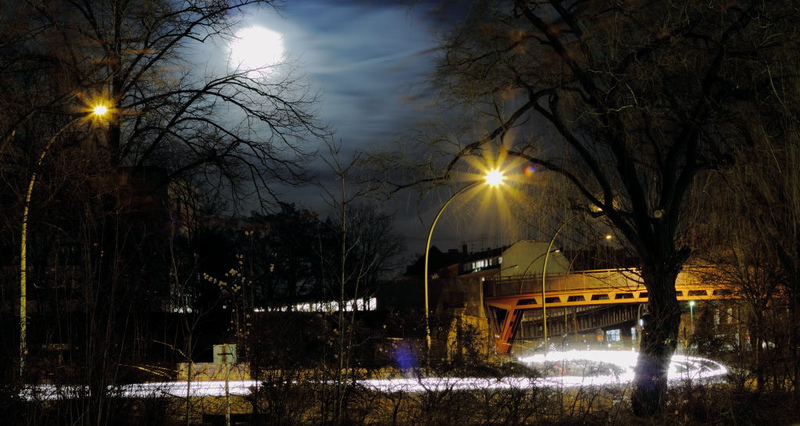 By night, Berlin is fox city. If you happen to be out on the streets at three o’clock in the morning, you will ineveitably run into one or two police cars slowly patrolling, a couple of lonely taxis speeding along the highways, and some foxes. At least one. In Berlin there are many more red foxes per acre than in the surrounding countryside. Urban starts to mean wild. More and more, the agricultural landscape has become a perfectly efficient substrate for growing corn in ever-enlarging fields and turning it into biofuel. The plots seem like vast stretches of moonscape, dusty and barren in winter, painted a uniform green in summer. The corn plants ache under the showers of pesticides like cancer patients in chemotherapy. The rural regions around the German capital have been converted into a pure extension of mere geometry, stretches of surface that are nothing but functional. A non-space where only one generation ago still some butterflies fluttered and at least some batches of poppies celebrated the crest of the summer with their fragile light. Foxes are still hunted by people in that zombie countryside. Foxes are not hunted in downtown Berlin, however. Here, apart from speeding cars, no dangers menace them. Here, the predators feast on the city’s abundant rats and on the garbage people throw out. They dig their dens in forgotten corners of the West End Cemetery, or within the elevated embankment on which the S-Bahn curves all the way to the Olympic stadium station. On this night in late May, the moon is strong, a bright beacon in the sky. A nightingale sings in the woods behind the rails. The air is dry. It should have rained weeks ago, but I prefer this arid atmosphere with its southern flavour. The dog is nervous from the start. As soon as I open the door, she dashes off. I follow slowly and then pause. She does not immediately appear again. Shadow and stillness, and the unmoved eye of the moon. I kneel down and touch the grass of the turf between two blocks with my fingers. It is as parched as dry moss on a rock. I look down the street. Nobody is out. I sit on the meadow, then I stretch my limbs and lay down on the grass, my head resting on my hand. I watch the shadows in that obscure corner where the dog has slipped into blackness. Nothing happens. My arm feels numb. I fold it by my side and lay my head on the grass. A couple walks by, chatting in low voices, not taking notice of me. The moon bathes me in its silver light. I feel sleepy. My thoughts drift toward a woman with whom I have fallen in love, a woman who lives on the other side of the Alps. The moon fuses presence and distance, transforming the effervescence of the light trickling through the black leaves into the swirling twinkle of sinking into her half-closed eyes. She is far away, though. On nights like these, only the moon can see us together. She is in Venice right now. She sent me a phone message with a picture of a lagoon under the night sky, the moon reflected by its soft waters. Then the poodle is back, a stretch of shadow a bit darker than the rest, visible only because of her movements from a few feet away. Her presence is more audible than visible. She chews something. I hear her teeth grinding. I lift my head and stare through the night towards her. Probably a bone. Yes, she has found a big bone. Somebody has thrown away a bone, the kind of bone with a hollow center that can be used to cook concentrated soups. Where my dog found it, there certainly is more to feast on, more contents of the trashbag somebody has put out and the fox has ripped apart. Cans sticky with dog food, used napkins, dry rice, a moldy slice of pizza. The bone must have been completely cleaned even before my dog took it. A fossile. A trophy. I hear her scrape her teeth along the hard surface. When I open my eyes the fox is there. I did not see it coming. My thoughts are too entangled, my eyelids too sticky from sleepiness. The fox stands still, frozen, incised into the night. His fur is a bit irregular, not red at all in the moonlight but palish grey with silver freckles glistening through erect guard hair on his back. These hairs are ignited by the dim night sky like a minuscule electrical storm. The fox looks at me. I look back. The moon shines on us and we watch each other. Then it turns to my dog. I observe that both animals are the same size. The poodle does not realize what is happening, preoccupied as she is with grinding her teeth along the bone. 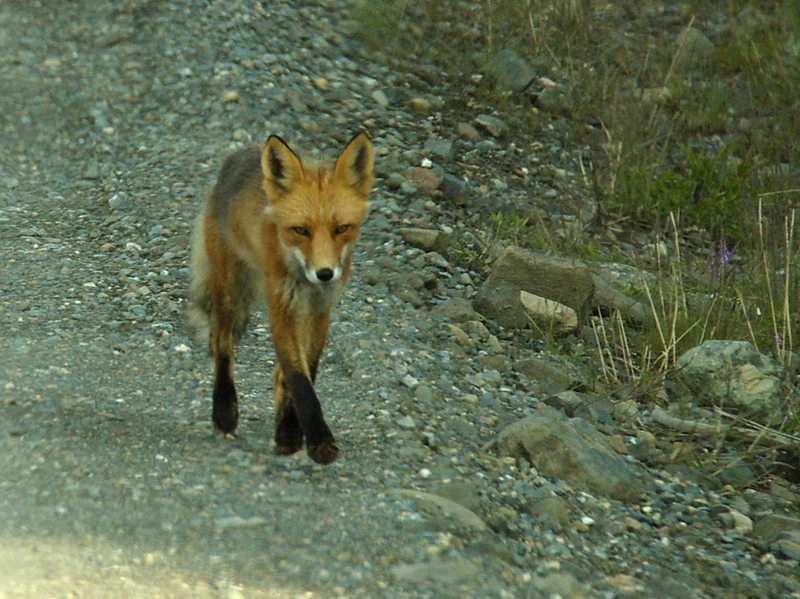 The fox is behind her and step-by-step without making any noise—hesitatingly, tentatively—walks closer. Sometimes the fox glances at me as though asking for permission. My heart beat quickens. The fox is not more than fifteen feet away. Still approaching, paw by paw. His snout is thin and long, like a dagger waiting to pierce. I breathe flatly. What will happen, if they fight? Will my dog be hurt? Will the fox suffer? So it was the fox’s bone after all, I think. Only a few days ago, a fox was shot by the police. It had been the mascot of the Prinzenbad public bath in the Kreuzberg neighborhood, a lively and mixed ethnic borough where young people from all over the world gather. 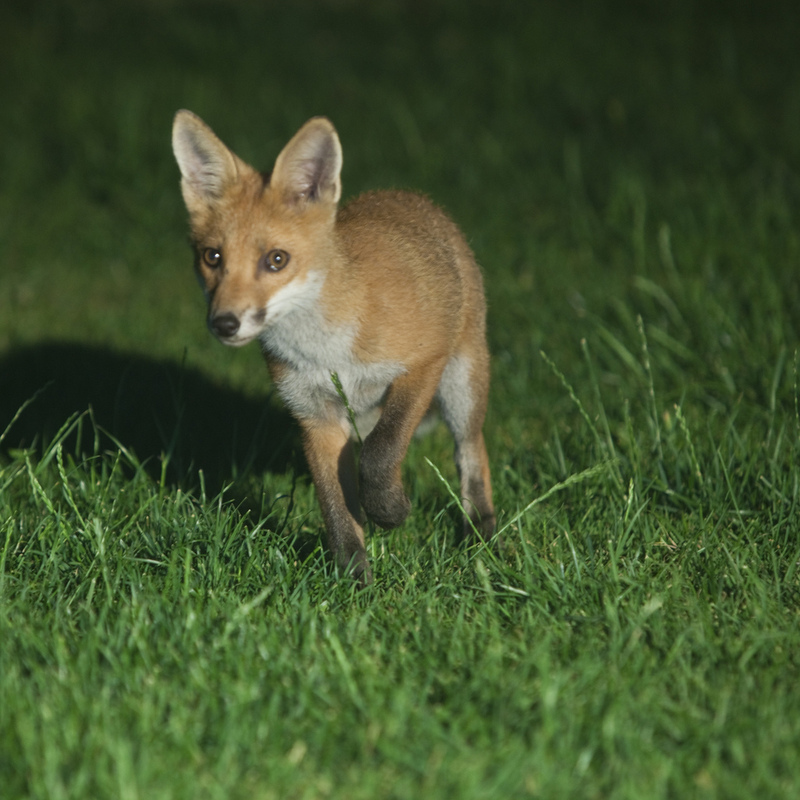 The fox had been living on the facility’s premises for years, roaming the meadows, thriving on thrash, chasing mice and rats. Everybody had fed it. Kids had caressed it. Then one day early this summer, bathers had found the animal in a lethargic state, hovering at the edge of a hedge, eyes aimlessly wandering. Its forelegs apparently were broken. Someone called the police. An officer shot it. Kids walked out of the bath in tears, traumatized, mothers screaming. What happened in Prinzenbad is not the rule. People are not afraid of foxes in Berlin. People don’t hate them. Many foxes are fed, although it is officially forbidden. They are loved. They bring a wild reality that follows its own sense of need into the bustling tangle of human activities and obsessions. The ways of the fox seem as necessary as the angle in which the moonlight carves the shadow of his elongated body onto the grass before my eyes. The fact that sometimes we can get so close seems like a promise that we may touch our own soft-furredness, the living animal within us. If the fox can prosper in the city, perhaps we can become more fully human. No one knows how many foxes live in Berlin. Hundreds at least. Thousands, maybe. There are other secret creatures my dog is trying to track down every night. Wild boars roam the plantations behind my condominium. Racoons chew on snails and their share of garbage. Beavers build dams and fell centuries-old trees in the gardens of the imperial Charlottenburg castle two miles north of my place. Ferrets hide under the hoods of cars parked on my street. It is impossible to get my dog past them without a search. She sniffs and scratches until the car alarm goes off. Owls are calling in many of Berlin’s forests (and some in the West End Cemetery) for 3.5 million human inhabitants to hear. Cranes circle the skies in late autumn. Forty percent of the city’s surface is covered by parks, cemeteries, forest, meadows, shrublands, lakes, sand dunes—more than nearly any other of the world’s big cities. Surely no other place in the world has a higher density of nightingales. The American musician and philosopher David Rothenberg comes regularly to play jazz with these birds in one Kreuzberg park. Citizens of Berlin generally welcome these animals, although probably very few people could tell you exactly why. Maybe because creatures such as foxes offer us a chance to seek what is real in a world that can feel full of fabrication. 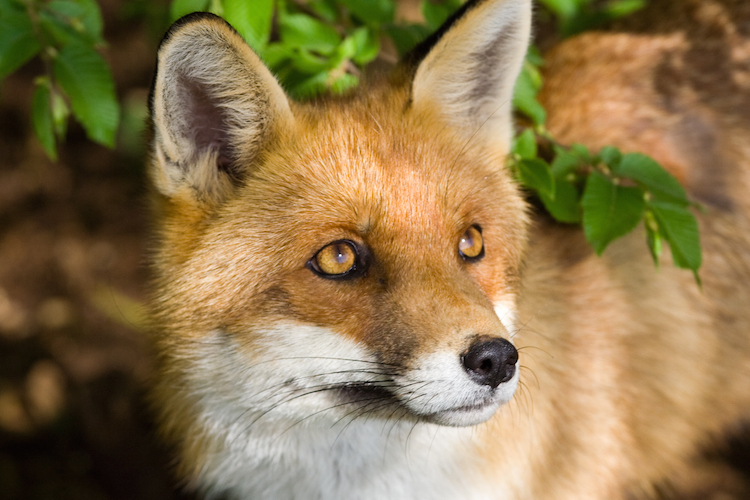 Foxes help us, creatures with beating hearts and shining fur, to expand our sense of what it means to be a human animal. “Everything that does not make you alive is too small for you”, the poet David Whyte writes. I hope I am not too small for the fox. Then my poodle has understood. With one stretch of her body, she is up and throwing herself around in mid-air, setting out to pursue the fox in a stretched gallop. All this obviously without a thought, without any fear (which she regularly shows toward bigger dogs). Wolves hunt foxes. Maybe right now this tangle of black fur cannot help being a wolf. Both animals dart into the brooding shadows. My dog’s wild barking marks the direction where they set off. Her voice becomes faint and fainter beyond the rail tracks. For a long while I remain stretched on the dry turf between the buildings, immobile, a black shadow among other shadows, a breathing-in and breathing-out among other breathings, a single lifeline going up and down among lines falling and rising. My poodle finally returns to join me and lies down in the grass, her body slightly pressed against mine, her eyes still and watchful. As I raise my head, I see that our figures outline a pale black shape on the turf, like a small island on which we are floating together while the moon is watching us. I blink as I look into the moonlight, knowing that its light caresses the silver swarm of hairs protruding from the fox’s back and tail and makes them sparkle. I look up and know that the moon watches the fox, and me, and my dog, and the deep trees, and the black softness of the bushes. 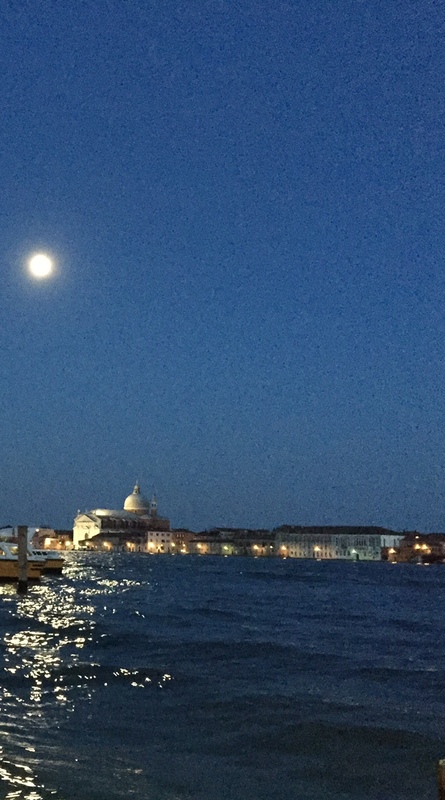 It watches my friend in Venice who no doubt has long ago fallen asleep, her face relaxing, her breath regular, in and out, on and off, undulating like the silver wake the fox’s fur left behind.